I got a call on Friday, February 24 from the Editor-In-Chief of the San Mateo Daily Journal. 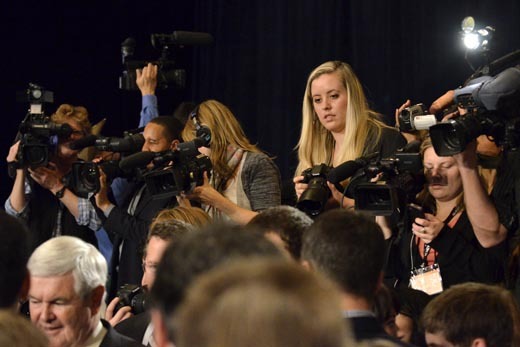 A photographer had not been assigned to cover the California Republican Convention in Burlingame the following day. He wanted to know if I could cover the event, which I could, due to the grace of some very understanding friends. 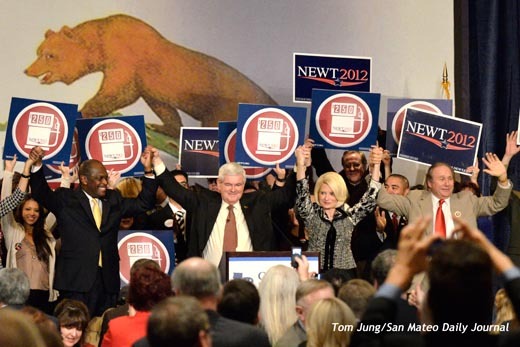 The main speakers included Marvin Cain, Newt and Calista Gingrich, and Michael Reagan, son of President Ronald Reagan. The crowds were obviously receptive to their combined messages, and gave the quartet a standing ovation. 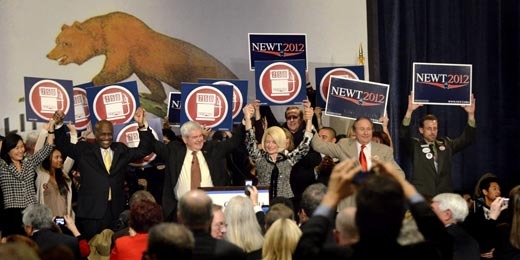 This event was slightly different from those I've covered in the past, as it was both a convention and a fund raiser for Mr. Gingrich. The dining room venue was tightly packed so that there were plenty of seats for those who could afford to pay a premium for a front row seat. As such, moving close would be out of the question, since the tables were densely packed. I looked around and found a spot to stand where I would not block the views of the donors. My lens was set to its maximum length of 200mm. Thanks to the vibration reduction feature built into this particular lens, I was able to handhold my shots at 1/160 of a second at F 4.0 and an ISO of 3200. I believe I met my goal of providing a visually interesting photo with four big names, an interesting background, and enthusiastic audience interaction. I also made some background images during the event. I shot a series of a photographer who managed to find the "high ground" on the elevated stage where she could hopefully get the shot she wanted. The crowd seemed to ebb and flow around Mr. Gingrich, testing this photographer's patience as the supporters, anxious for a handshake and some encouraging words, popped in and out of her viewfinder. Slowly but surely, the subject started making his way to the exit, moving further and further out of camera range. I'm sure that every photographer knows the feeling of watching the chance to make a great photograph slip, or in this case walk, away.